Basically, an event has a “Meet and Greet” character and is designed to promote the exchange of information and communication between players. This means, players usually meet with a specific occasion and have fun together! And how does it actually work with events and Party Flags? First you create your free event on flagstack. net/events. On the map the Party Flag will appear as a “Main Flag” of the event after being checked by the FLAGSTACK HQ. The main flag itself can only be collected from the start time of the event – for 12 hours. If the organizer has linked a special icon to the event, it will be added to your player account by collecting the main flag. Event Party Flags – What are they good for? Only close to this main flag you can select the event package you want to buy, which you have won before or bought in the shop. The system will deploy the 25, 50 or 100 flags fully automatically in a radius of 500 m around the main flag and they will remain at the random coordinates for 12 hours. Every event participant (including the layman) can collect these flags – but the layman does not receive capture-on points. The Party Flags (light green) spread on the map are automatically published in the above mentioned radius by the system. It is not possible to check whether the Party Flag is in a secure area or how good the mobile phone reception is. Therefore, Party Flags may be inaccessible to players in individual cases. If flags from the event package are located in areas that are not accessible, you can move them by 150m as the flag owner – similar to other flags. The ability to plan: Please note that there is a deadline of at least one week before the event. This is necessary so that the event can be checked and published. And of course, that interested players have enough time to register. Stacking: Stacking events at the same location does not make sense. Therefore, there must be a minimum of 24 hours between two events at the same location. 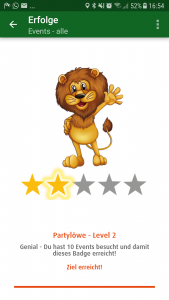 Event-Badges: There are also badges for organizing and visiting events. 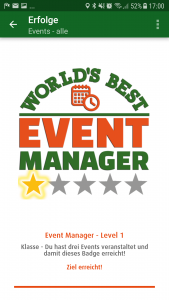 In order for an event to count for the organizer’s “Event Manager” badge, at least 5 participants must have captured the event’s “Main Event Flag”. Accessibility: The stationary location and a radius of 500 metres around the event flag must be open to the public. With this arrangement we want to create fair conditions for all players – every FLAGSTACK player should have the same possibilities and basic requirements to get his points – also with the Party Flags. Prerequisite: At least 5 participants must have captured the Event Flag per event.